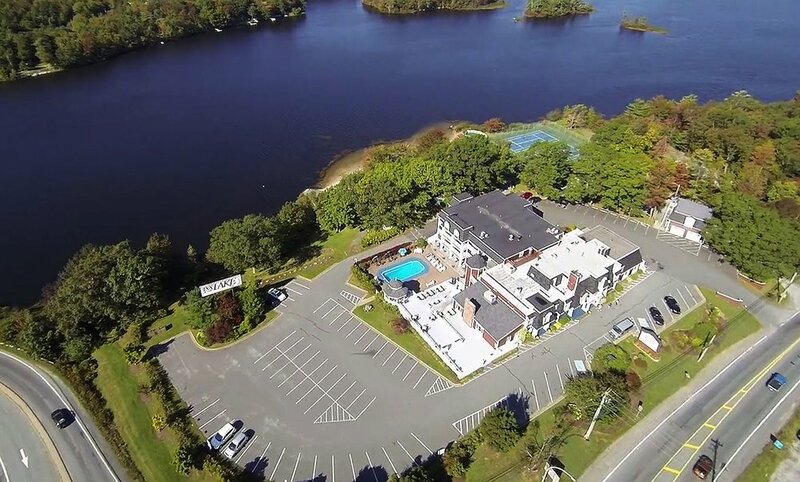 Inn On The lake is a boutique hotel located 10 minutes from the Stanfield International Airport and 20 minutes from Halifax. The hotel is situated on four acres of parkland on the shores of Lake Thomas. The property has 39 unique guests rooms and four meeting/special occasion rooms. It also has a popular gastropub and contemporary dining room. They feel the Inn is like a home when they are away from home. The Inn is an ideal hub location for day trips throughout mainland Nova Scotia. The Inn has 39 rental units. Unlike most box hotels these units are unique. Some have fireplaces, some have whirlpool tubs, some are two story suites and others are studios. The furnishings are either Queen Ann or Contemporary. All units have a microwave and refrigerator. Take a few minutes to explore which room suits your mood for this visit. Encore is a relaxing room filled with captivating design elements. The food is contemporary. The menu offers daily specials that follow a seasonal theme. The music is soft, leaning towards southern blues. Servers are unassuming and knowledgeable. There are a variety of seating options depending on group size and desire for privacy. Oliver’s Gastro Pub is an inviting space where locals, travelers and tourists gather for good cheer. The room’s mahogany and brass glow in the flickering light of the fireplace. The music has a strong southern blues feel. The menu offers several pub favourites and items from the dining room menu. Each evening the chef prepares a seasonal special for the pub patrons. The Inn offers 4 meeting rooms and several suites that can be used for break-off venues. Unlike many meeting facilities there are no casinos, or late night clubs within miles of the Inn to distract attendees. The Inn does offer attendees the opportunity to network both in Oliver’s and Encore. Facilitators can even conduct break off sessions in the parklands. Various food services are available. Since 1986 we have hosted many events; weddings, birthdays, Christmas parties, retirement parties, wine society dinners, wakes, corporate product announcements, employee and customer appreciation events, etc. Some events have been in the parklands, some on the patio, some in the pub, others in the restaurant or our meeting rooms. The food has varied from stand up hors d'oeuvres to a sit down six course meals. We cater business meetings, social events, private jets, the off-shore and various other groups. We are experienced at delivering a wide variety of offerings ranging from breakfast baskets to gourmet dinners. The only limitations we encounter are lead time to source the ingredients and the availability of facilities and equipment at the client's location.